Depending upon the type, household batteries are either recycled, turned in at household hazardous waste mobile collection event and collection centers, or discarded in the trash. Some of these batteries have potentially harmful metals and must be handled properly. As of July 1996, Iowa law requires retailers and manufacturers of household batteries to have a collection and recycling system for nickel-cadmium (NiCad), mercuric-oxide, and small lead-acid batteries. Alkaline and carbon zinc batteries–These include non-rechargeable batteries used in toys, flashlights, and other common applications. Batteries that are no longer manufactured with mercury and come in a variety of sizes and voltages are also included. Mercuric-oxide batteries–These include the non-rechargeable batteries used in hearing aids. These batteries must be saved for a toxic clean-up day, disposed of at a household hazardous waste regional collection center, or returned to those hearing aid centers that have a recycling program. Check with manufacturers or retailers for the availability of a local collection system. Nickel-cadmium (NiCad) batteries–These include rechargeable batteries used in rechargeable kitchen appliances, rechargeable power tools, and other household applications. 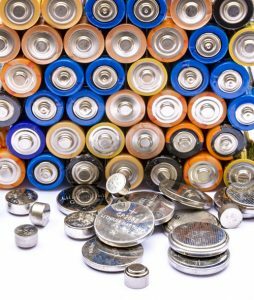 Save these batteries for a toxic clean-up day, dispose of them at a household hazardous waste regional collection center, or check with manufacturers or retailers for the availability of a local collection system. Small lead-acid batteries–These include rechargeable batteries used in camcorders, laptop computers, cellular phones, etc. Save them for a toxic clean-up day, dispose of them at a household hazardous waste regional collection center, or check with manufacturers or retailers for the availability of a local collection system. Bring these batteries to a household hazardous waste collection event, to the landfill, or to the Regional Collection Center during regular business hours. Call SCISWA at 641-828-8545 or 1-888-603-CREW for more information.